The production of additional K2 main battle tanks has been delayed by three years due to technical issues. 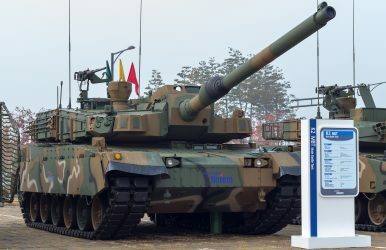 South Korea had to push back plans to produce an additional 100 Hyundai Rotem K2 (Black Panther) main battle tanks (MBTs) for the Republic of Korea Army (ROKA) by three years, the Defense Acquisition Program Administration (DAPA) said. In an annual auditing report to the South Korean National Assembly on 13 October, DAPA said that the delay is caused by technical issues related to the K2s domestically-produced transmission system while retaining the 1,500 horsepower (1,100 kW) 12-cylinder diesel engine manufactured by the South Korean Doosan Corporation for the powerpack. Initially, the production of 100 additional K2 MBTs was expected to be completed by the end of 2017. The updated DAPA schedule now foresees the completion of the second mass production and deployment of the K2 between 2019-2020. Overall, the ROKA has a requirement for over 600 K2 tanks (some sources say 400) complementing its K1 MBT force and replacing its aging fleet of M48 Patton MBTs as they are being slowly phased out. Armed with a license-produced Rheinmetall 120 mm/L55 smoothbore gun and fitted with both modular composite armor of undisclosed type and Explosive Reactive Armor (ERA) blocks, the 55-ton K2 is reportedly one of the world’s most advanced MBTs. The tank’s main gun, featuring an automatic loader, has a maximum rate of fire of 10 rounds per minute and can shoot the Korean Smart Top-Attack Munition— top-attack fire-and-forget projectiles fitted with their own guidance system. This new munition enables the tank to engage targets from covered positions. The MBT is equipped with an advanced fire-control system linked to an extremely high frequency radar system. The K2s crew consists of a commander, gunner and driver. Hyundai Rotem has also plans to export the tank. Also, as I reported previously,Turkish military vehicles manufacturer Otokar signed a contract with Hyundai Rotem for technological transfer and design assistance in 2008. The K2 serves as the basis for the development of Otokar’s Altay MBT. “Both tanks share the same base design including the chassis, although the Altay is purportedly slightly longer, equipped with heavier armor, and, in comparison to the K2 MBT also sports a modified turret with composite armor,” I explained. South Korea’s next batch of K2 main battle tanks will run on a German-made transmission system. Russia’s T-90M Main Battle Tank to Complete State Trials in 2019India and Pakistan’s Main Battle Tank Forces: An OverviewRussia Orders 132 T-14 Armata Main Battle Tanks and T-15 Infantry Fighting VehiclesIs China Equipping Its Marine Corps With a New Lightweight Battle Tank?Would North Korea Risk the Death of 10,000 Chinese Citizens to Capture Seoul?